50 (Stockwell Station & Croydon High Street) Re-awarded to Arriva London South using existing fleet 2010 Euro-V Volvo hybrid double-decks (new contract start date 26th August 2017). 66 (Romford Station & Leytonstone) Re-awarded ro Arriva London North using existing fleet 2009-2011 Euro V DAF diesel double-decks sourced from routes 141,243 and 341/N341 (2nd September). 103 (Rainham Station & North Romford) Awarded to Arriva London North using existing fleet 2009-2011 Euro V DAF diesel double-decks sourced from routes 66,141,243 and 341/N341. 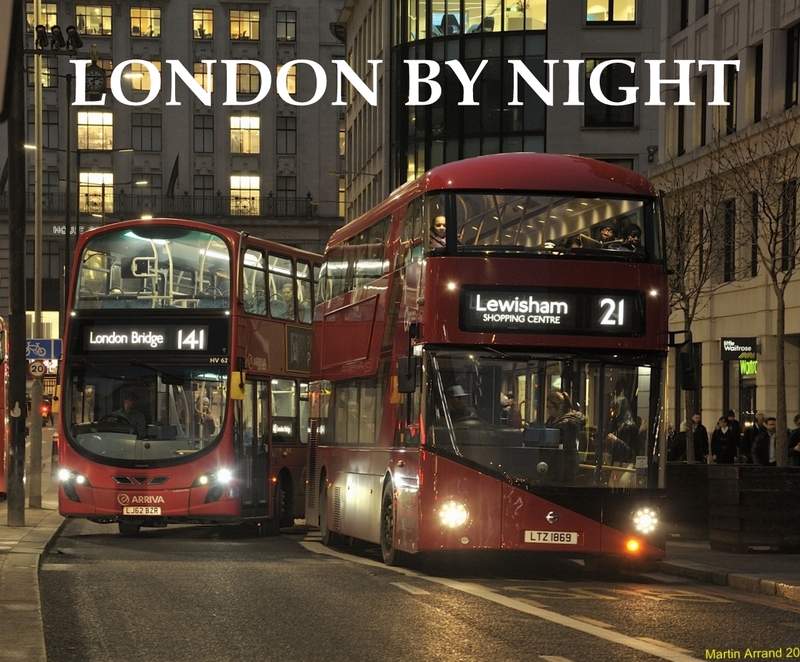 Currently operated by Stagecoach East London (14th October). 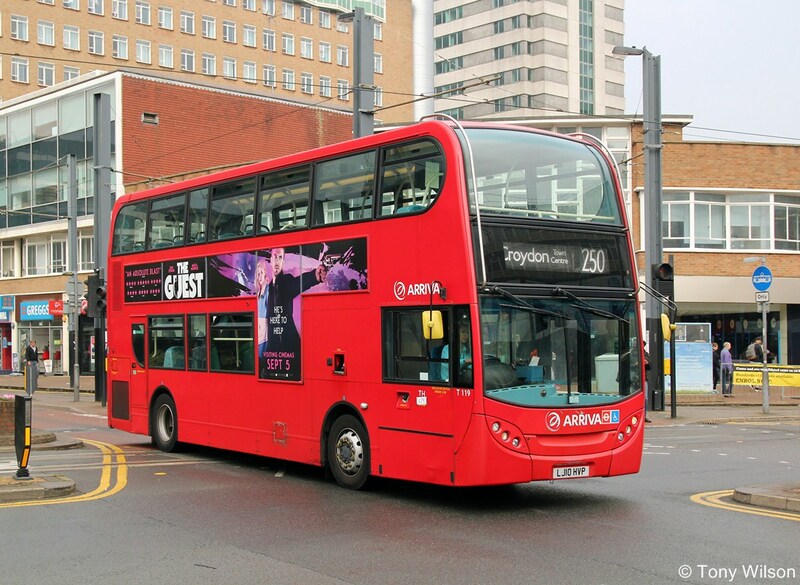 130 (Norwood Junction & New Addington) Awarded to Abellio with new Euro-VI diesel double-decks (26th August). 150 (Becontree Heath & Chigwell Row) Re-awarded to Arriva London North using existing fleet 2009-2011 Euro V DAF diesel double-decks sourced from routes 66,141,243 and 341/N341 (14th October). 175 (North Romford & Dagenham) Awarded to Arriva London North using existing fleet 2009-2011 Euro V DAF diesel double-decks sourced from routes 66,141,243 and 341/N341. Currently operated by Stagecoach East London (14th October). 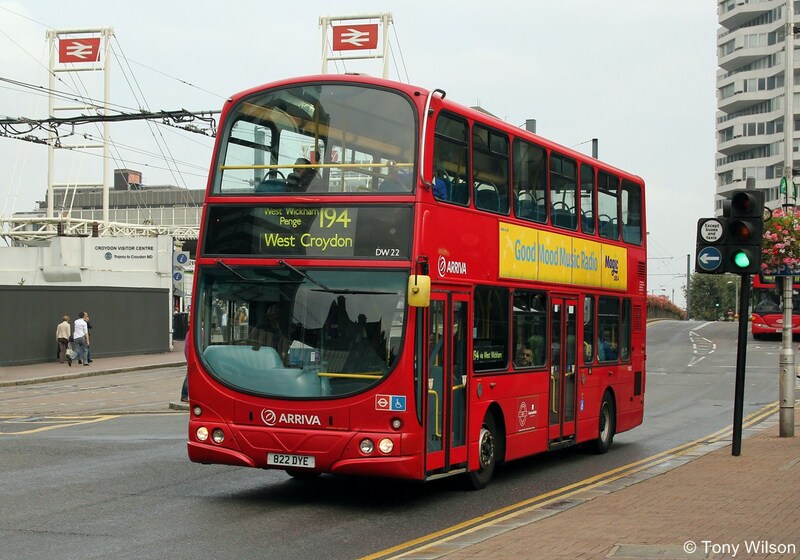 194 (Lower Sydenham & West Croydon) Re-awarded to Arriva London South using existing fleet 2009-2011 Euro V DAF diesel double-decks sourced from routes 141,243 and 341/N341 (26th August). 250/N250 (Croydon & Brixton Station) Re-awarded to Arriva London South using existing fleet 2010 Euro-V ADL diesel double-decks (26th August). 255 (Balham Station & Pollards Hill) Re-awarded to Arriva London South using existing fleet 2012 Euro-V ADL diesel single-decks (26th August). 257 (Stratford & Walthamstow Central Station) Awarded to Stagecoach East London using existing fleet 2012 Euro-V ADL diesel double-decks sourced from routes 101 and 103, plus new Euro-VI hybrid double-decks. Currently operated by Go-Ahead London General (14th October). 266/N266 (Brent Cross Shopping Centre & Hammersmith) Temporary short-term 2-year contract awarded to Metroline West using existing fleet 2007 Euro-IV ADL diesel double-decks sourced from routes 17 and 217 (29th July). 280 (Belmont Station & Tooting) Re-awarded to Go-Ahead London General using existing fleet 2011/12 Euro-V Volvo hybrid double-decks sourced from routes 19 and 436 (22nd July). 289 (Purley Station & Elmers End Station) Re-awarded to Arriva London South using existing fleet 2012 Euro-V ADL diesel single-decks sourced from routes 397 and W11, plus new Euro-VI single-decks (2nd September). 314 (Eltham Station & New Addington) Re-awarded to Stagecoach Selkent using existing fleet 2012 Euro-V ADL diesel single-decks (2nd September). 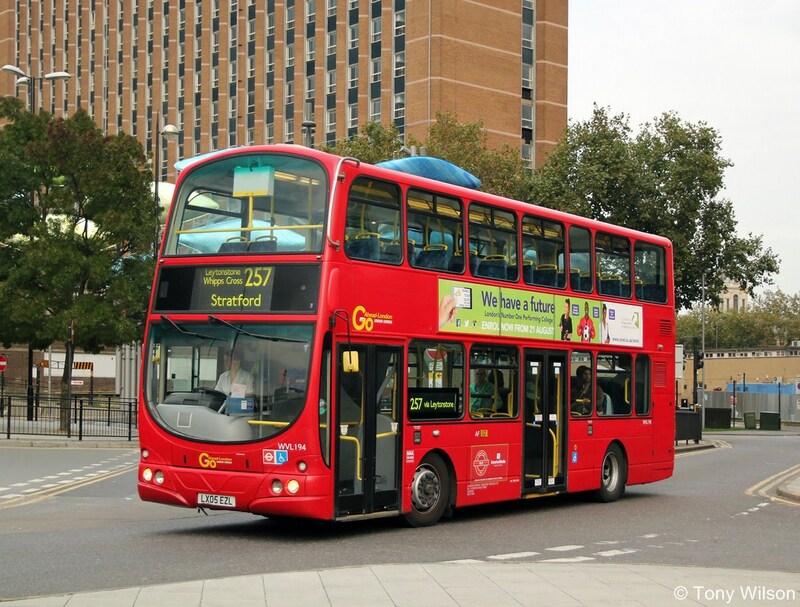 341/N341 (Northumberland Park & County Hall) Re-awarded to Arriva London North with new Euro-VI hybrid double-decks (14th October). 370 (Romford & Lakeside) Re-awarded to Arriva London North using existing fleet 2009-2011 Euro-V DAF diesel double-decks sourced from routes 66,141,243 and 341/N341 (4th November). 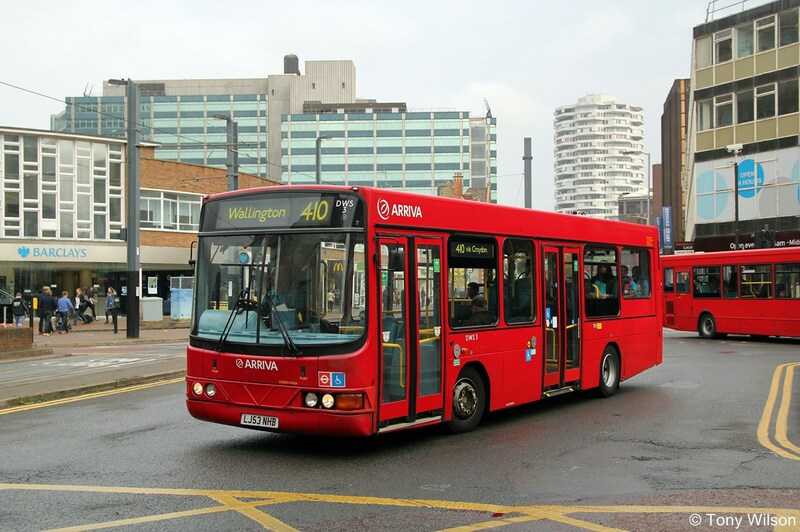 410 (Wallington & Crystal Palace) Re-awarded to Arriva London South using existing fleet 2012 Euro-V ADL diesel single-decks sourced from routes 397 and W11, plus new Euro-VI single-decks (26th August). 621 (Lewisham & Avery Hill, schooldays-only) Re-awarded to Stagecoach Selkent using existing fleet Euro-V ADL diesel double-decks sourced from route 101 (14th October). 636/637/638 (Kemnal College & Grove Park, schooldays-only) Routes 636/637 both withdrawn and absorbed into route 638 re-awarded to Stagecoach Selkent using existing fleet 2008/9 Euro-IV Scania diesel double-decks (2nd September).